I’ve always loved eating pies and tarts but I seldom make them because making them seemed too tedious to me sometimes – the cutting of butter and shortening into the flour, waiting for the dough to rest, rolling it out and praying that it will not tear / stick, blind-baking it, making the filling, then baking again… all these seemed too much effort that more often than not, I ended up baking a cake (which can be really quick and super easy). Galette is a French term which refers to flat, round or freeform cake, usually made with a flaky pastry crust. It is something like a tart but it does not test my rolling skills nor does it need to be blind-baked first, which makes it a whole lot more tempting to make them. And since Bake-Along is round the corner, I decided to bake one to join the event! On a side note… I’ve shifted all my mailing listees to MailChimp and will be managing all emails sent out for the website there. Don’t worry I’ve disabled all the other email sending programs/devices/what-nots so you shouldn’t be receiving double emails. If you did not receive any new updates, it’s highly likely that the mail went into your junk mail, so please give there a check! If not… please sign up again! The signing up form is on the column on the right or at the end of every post (: And if you sign up before 25 De 2015, I’ll be sending out a free eCookBook to all of you! This is only valid for mailing listees as I cannot send out emails to WordPress Followers, sorry about that! 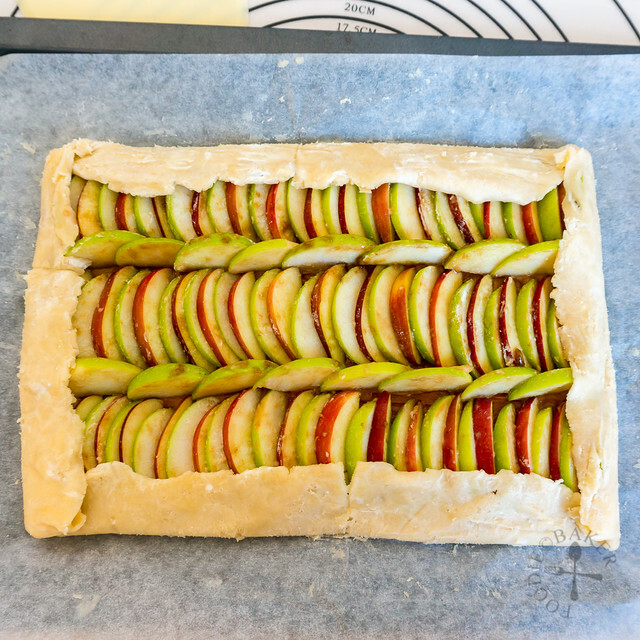 We always have apples lying around at home so the best way to use them up is definitely in a pie or tart, and in this case, a galette! I spread natural peanut butter at the base, making it an apple and peanut butter galette. I first learned about natural peanut butter when I was researching for a snack / treat recipe to make for my friend’s dogs. Natural peanut butter is a nut butter that contains at least 90% peanuts with no artificial sweeteners, colours or preservatives. Conventional peanut butters contain hydrogenated oils (such as palm oil), which acts like a stabilizer so that the oil and butter won’t split. As natural peanut butter doesn’t contain any other additives, the peanut oil and the peanut butter will split, so stirring is always required to combine the two together before using. It’s also a lot softer and liquid-y at room temperature as compared to conventional ones. In terms of nutritional value, I’ve read that as long as conventional peanut butters do not contain any sugar (which I think is quite rare), it’s pretty much similar to the natural peanut butter. I grew up eating the conventional ones but am slowly getting addicted to the natural ones as they taste nuttier (though they are also more bland as they do not contain salt or sugar). But don’t let this natural peanut butter stop you from making this galette! You can simply use any peanut butter spread you have at home to make this delicious and addictive treat. If they are too stiff to be spread, simply microwave it or heat it in a small pot until is watery enough to be spread on the crust. The crust is buttery and flaky from the use of a mix of butter and shortening. 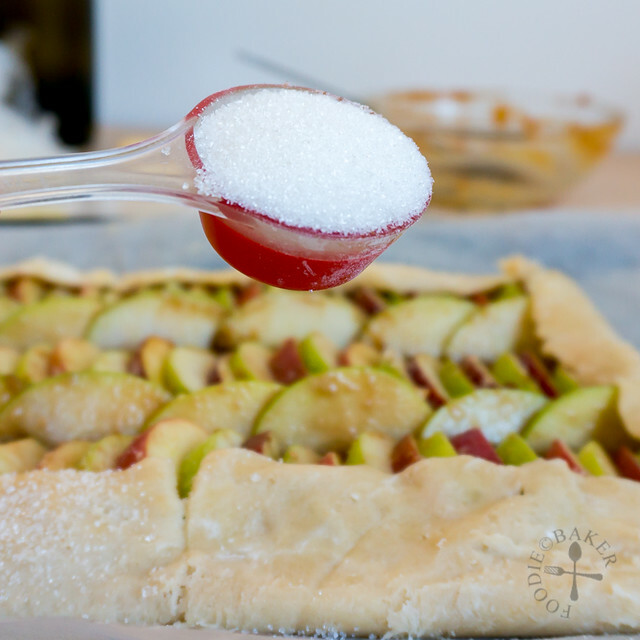 The red and green apple slices overlapping with each other create a very pretty tart (I took so many photos of this galette that I had a hard time choosing them for the blog) and their sweetness makes a nice complement with the slightly salty peanut butter. 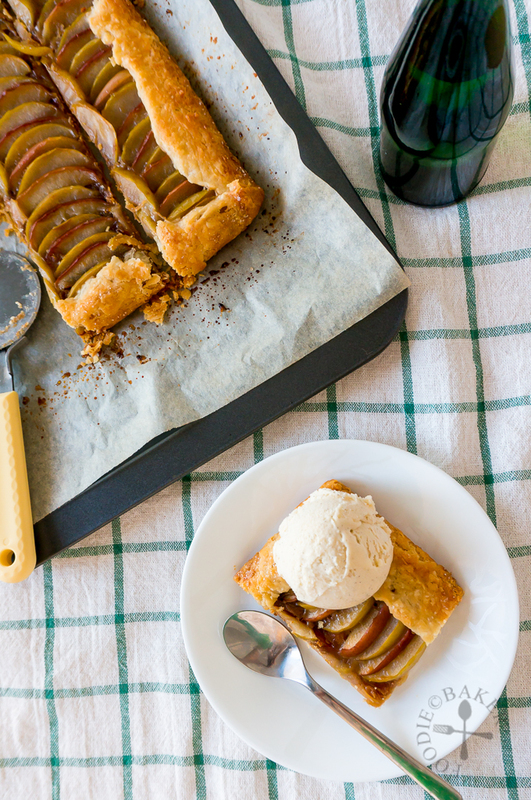 Served with a scoop of ice cream, this is absolutely divine! I had to wait until the galette was cooled completely so that the ice cream won’t melt too fast when I’m photographing them, but it’s definitely wayyyy better when it’s warm from the oven. I’m gonna dig in and leave you with the step-by-step photos! 1) Roll out the pie crust into a 13 x 9-inch rectangle. Chill in the refrigerator for 10 to 15 minutes. 2) Whisk peanut butter, maple syrup and salt together in a small bowl. 3) Peel (if desired) and core the apples. Slice them thinly and toss in a bowl with flour and brown sugar. 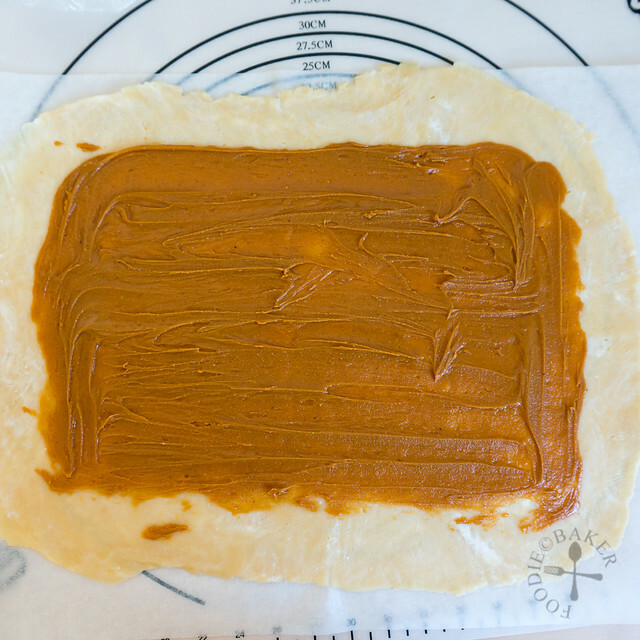 4) Spread the peanut butter mixture on the dough, leaving a 1-inch border all around. 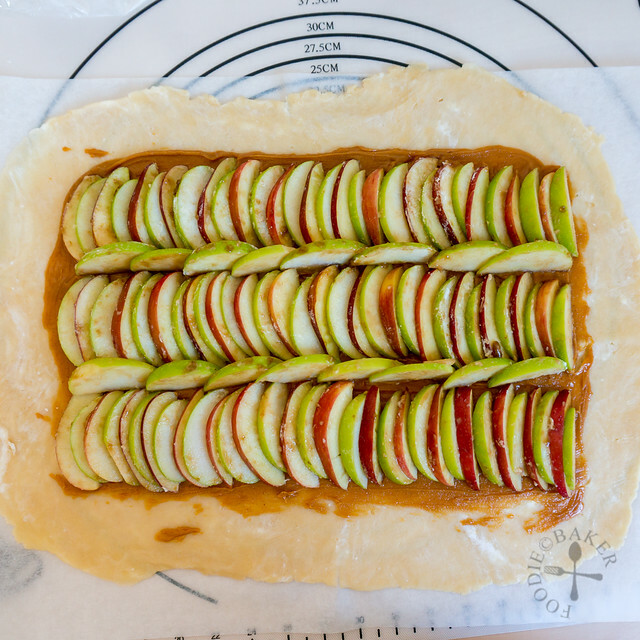 5) Arrange the apple slices on the dough, overlapping them slightly. 6) Fold up the crust border onto the apple slices. 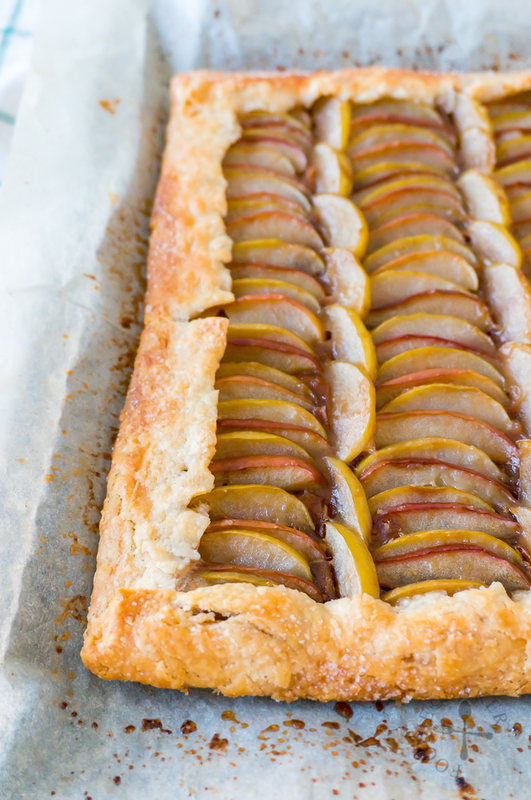 7) Sprinkle caster sugar all over the apple and crust border. 8) Cover the galette loosely with aluminum foil then bake for 35 minutes. Remove the aluminum foil and continue to bake for 10 to 15 minutes until the crust border is golden-brown. Best served warm with whipped cream or a scoop of ice cream! This is for Bake-Along #88: Galette hosted by Zoe from Bake for Happy Kids, Joyce from Kitchen Flavours and Lena from Her Frozen Wings. *I used all-natural peanut butter that is not flavoured with salt or sugar. 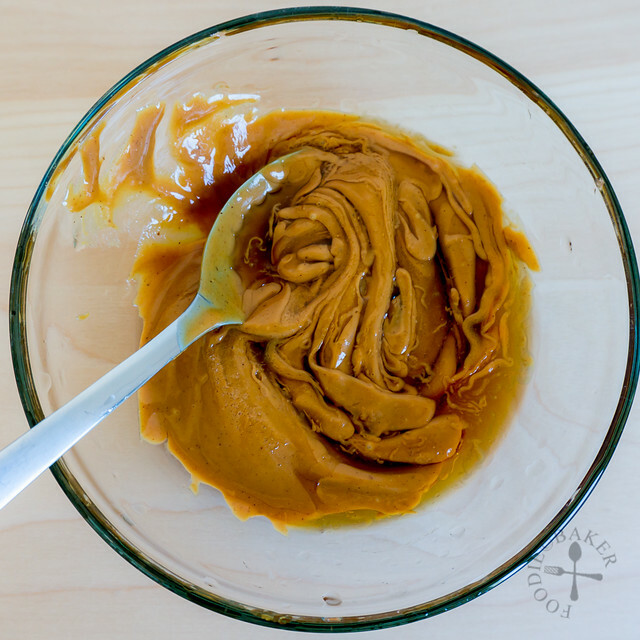 If you are using peanut butter spread, you can microwave it a little so that it's easier to spread. Preheat oven to 190C / 375F. Set aside a baking sheet. 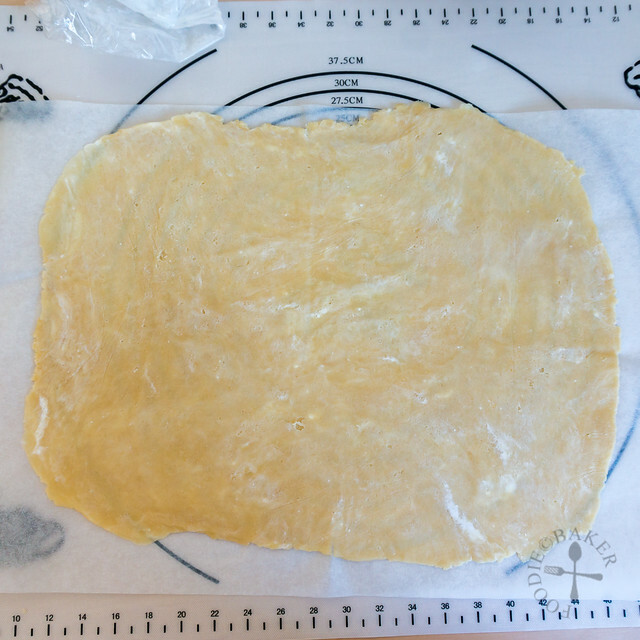 Place the Basic Pie Crust on a large piece of parchment paper or silpat (if you have one). Place the plastic wrap on top of the dough and roll it out into a 13 x 9-inch rectangle. Chill in the refrigerator for 10 to 15 minutes. While the dough is chilling, whisk peanut butter, maple syrup and salt together in a small bowl. Peel (if desired) and core the apples. Slice them thinly and toss in a bowl with flour and brown sugar. Spread the peanut butter mixture on the dough, leaving a 1-inch border all around. 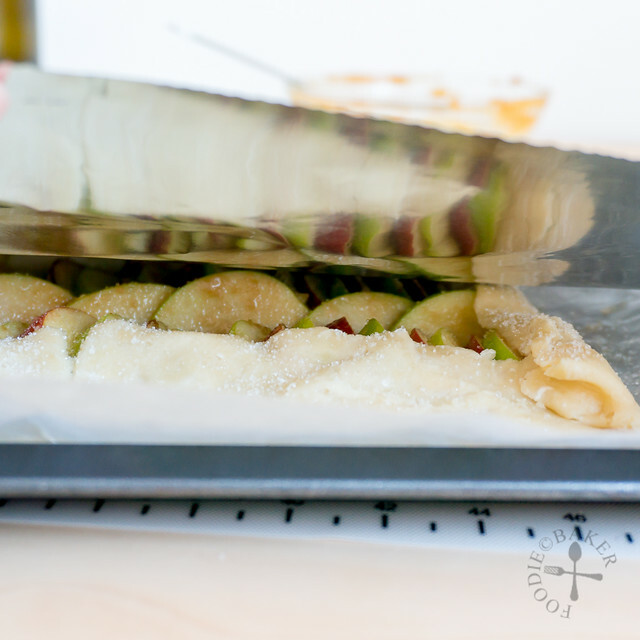 Arrange the apple slices on the dough, overlapping them slightly. 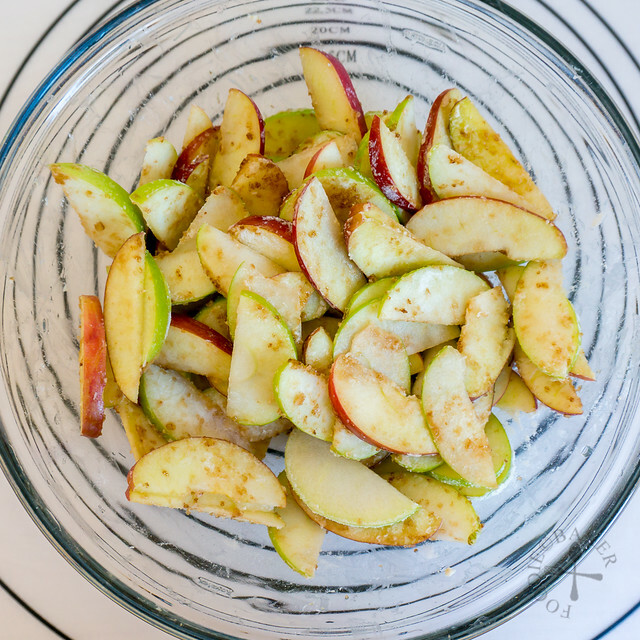 Fold up the crust border onto the apple slices. 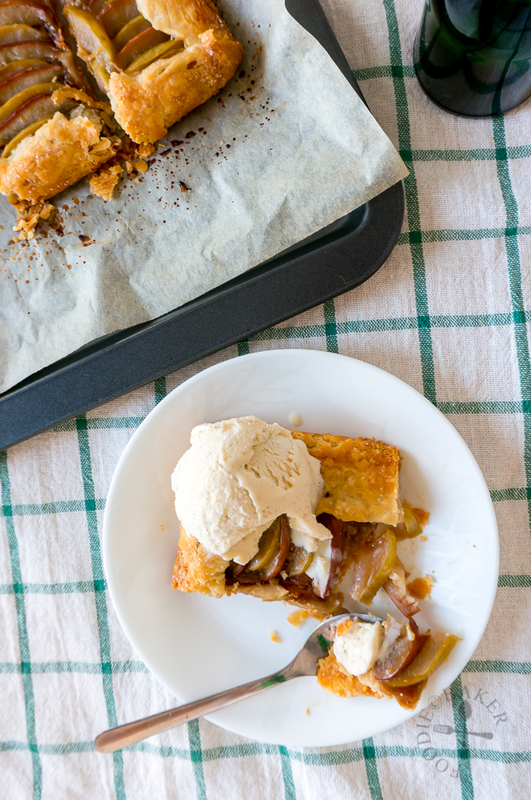 Sprinkle caster sugar all over the apple and crust border. Cover the galette loosely with aluminum foil then bake for 35 minutes. Remove the aluminum foil and continue to bake for 10 to 15 minutes until the crust border is golden-brown. 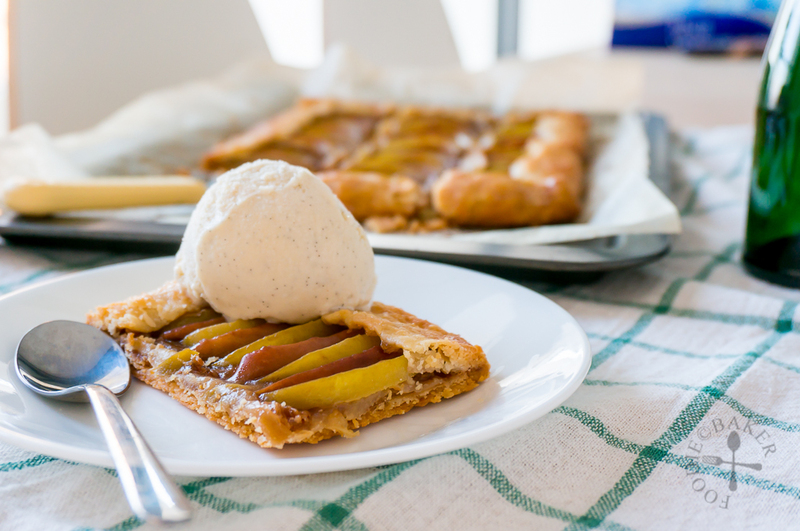 Let cool slightly before serving - the galette is best served warm with whipped cream or a scoop of ice cream. 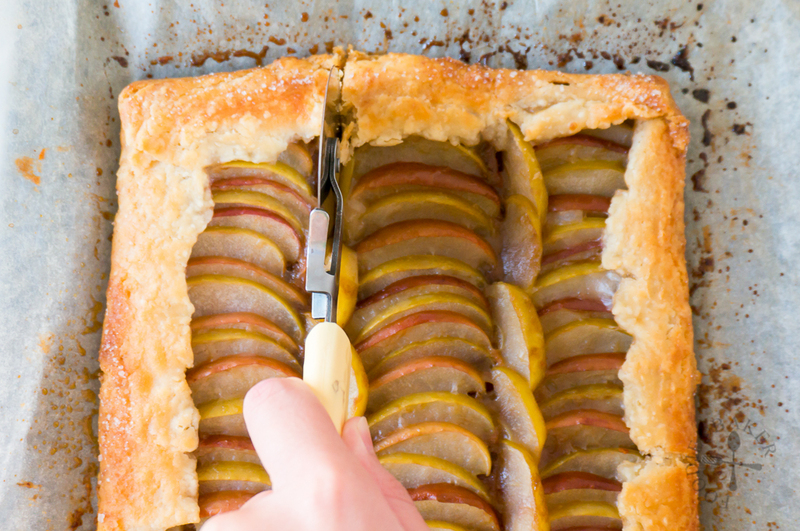 Your galette looks so beautiful with the overlapping apples. Peanut butter spread sounds good! And especially delicious served with the ice cream! Yummy! Haha an appear and pear galette sounds delicious too Susan! Will try out the combination, with peanut butter, next time! hi jasline, like you too i seldom make tarts and pies due to those work involved. Lovely lovely pictures, thx on the info on the natural peanut butter, i’m sure it it a fantastic combo with the apples! Hi Lena! Thank you so much for the compliments, natural peanut butter is not so common in Singapore yet, but I’m sure they will hit the market soon! Natural peanut butter is a must! I only want two ingredients, peanuts and salt. Looks like it made this dish even more amazing! That ice cream perfects on that galette, Yum! We love peanut butter + bananas but I’m sure this combo of peanut butter + apples taste great too 🙂 Wish I could have a slice to try ^-^! Hi Karen! Oooh I’ve always loved the combination of PB and bananas, perhaps I’ll give this combo a try for my next galette! Wish I can send you a slice to try! Peanut Butter and Apple sounds like another superb combination. 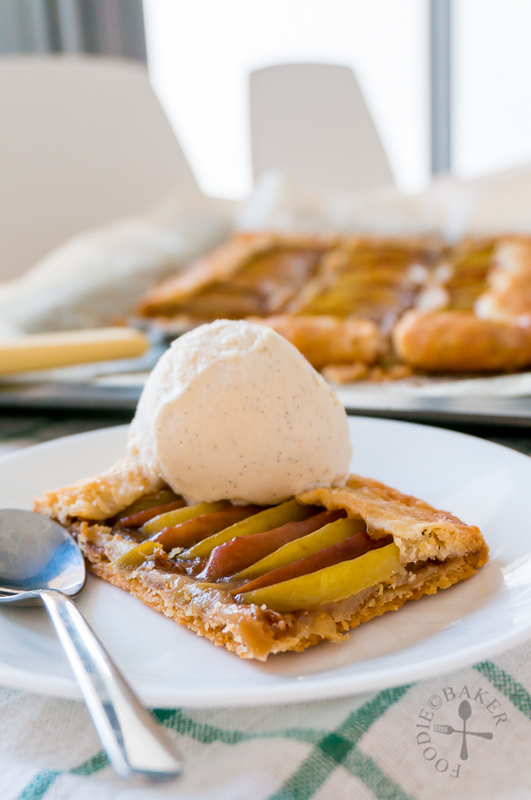 Your idea of using PB and apple to make this easy galette is brilliant! Love it!!! Thank you for choosing such a brilliant theme again Zoe! I had fun with this bake! Great idea for adding peanut butter! These look great! Hi Sharon! Hahah yes this will definitely work nicely for us… I have no patience for small pies and tarts too! And this is a whole lot easier as there’s no transferring of dough to a pie dish or blind-baking needed. Thanks for dropping by! Hi Heather! Thank you so much for your sweet compliments. I first made mine with peaches, plain too! And I fell in love with the idea of galette immediately. I’m so happy you like this peanut butter version! All my favorite things (crust and peanut butter) in one special place! This galette is so beautiful, Jasline! Thank you so much Mir, the combination was lovely! Hi Jasline, your apple peanut butter galette look fantastic, well done. Hi Amelia! Thank you so much for your sweet words, how I wish I can send you a virtual slice of the galette!